A few states have implemented standards and laws that allow for the installation and use on residential on-site greywater systems. The definition of greywater may differ from state to state, but greywater is usually defined as “untreated used household water that does not contain human wastes”. Examples of greywater include: wash or rinse water from a sink, shower, bathtub, or other household fixture, excluding a toilet. Some definitions of greywater exclude wastewater from sinks, dishwashers, or clothes washers because this water may have come into contact with human wastes such as a soiled diaper. In areas where greywater systems are permitted, water that does not contain human wastes or pose a health hazard may be reused for toilet flushing and outdoor irrigation of non-food plants. Greywater and dual plumbing systems, where permitted, are an option for reducing water use. Check the local regulations in your area before designing a greywater reuse system. Also be aware that as efficiency improves in indoor fixtures and appliances there will be less water available for greywater reuse. Greywater systems can be cost effective in homes with large indoor water demands, but may be of little benefit for most single-family homeowners. Greywater systems generally consist of a three-way diverter valve, a treatment assembly such as a sand filter, a holding tank, a bilge pump, and an irrigation or leaching system. The holding tank cools the water and temporarily holds it back from the drain hose. Systems can either be custom designed and built, or purchased as a package. Techniques include recessed or raised planter soil boxes, water injection without erosion, gravity or pressure leach chamber, and irrigated greenhouses. Some system components can retrofit existing irrigation systems. One of the toughest challenges in designing the greywater system is laying out the irrigation system and determining the size of the area to be irrigated. The homeowner or designer must decide which plants can be irrigated with greywater. The soil type, the volume of greywater produced, and the summer water requirements of the plants determine the irrigated area. If greywater systems are permitted in your region, contact a professional plumber or manufacturer for information on installation. Because conventional wastewater plumbing lines combine black and graywater, separating the two generally involves a parallel wastewater system. Space must be available for larger components such as a holding tank or some filters, which can be located in a basement, shed, or possibly outside. Your residence must lie outside of the active flood plain. The greywater must originate from your residence. Depending upon local regulations, your greywater may only be used for landscape irrigation at your residence. Your greywater must never be allowed to leave your property. Your greywater system needs to have a way to discharge to the septic or sewer system in the event of plugging or any other problem with your graywater quality or the system itself. Piping should be PVC or ABS. Make sure your greywater storage has a secure cover for safety and mosquito control. If above ground, be sure your greywater storage is childproof. Sources: Vickers, Amy. 2001. Handbook of Water Use and Conservation. Water Plow Press, Amherst, Massachusetts. 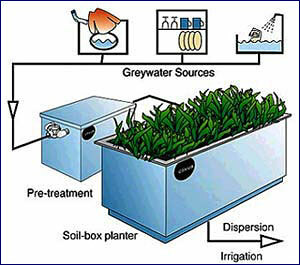 Greywater, usually defined as “untreated waste water which has not come into contact with toilet waste”, is used as a supplementary irrigation supply for watering plants. Because most greywater systems do no include large cisterns or storage tanks the greywater must be used promptly or it is piped off to the sewer. In areas with a year round irrigation season, greywater can be used continuously. However, much of the country where the growing season ends in the fall cannot make use of greywater for a substantial part of the year. Theoretically greywater could be used to water indoor plants during the winter months, but this could prove problematic if the greywater system does not provide sufficient filtration to remove potential sources of odor and bacteria. Because of these seasonality issues, greywater systems are more practical and cost effective in warmer climates with longer irrigation seasons. I have looked for the past year for someone who knows (or wants to learn) anything about the dual plumbing needed for separating grey water from black water in the house. I am looking for someone preferably close to home, but am also considering remote design work if I can find a local plumber to do the on-site work. I have talked to general contractors, plumbers, and bathroom designers. I have contacted the local extension office and the county conservation district office for suggestions.